Yes, I'm still alive...and I do plan on creating a proper post over the weekend. For now though, I need your help and advice! Has good memory. I've been afraid to use a 100% cotton because it could stretch out and grow while wearing it, but tell me if I'm wrong! Has good adult colors. There are some really nice cotton blends that seem to be especially for baby. So whaddya think? 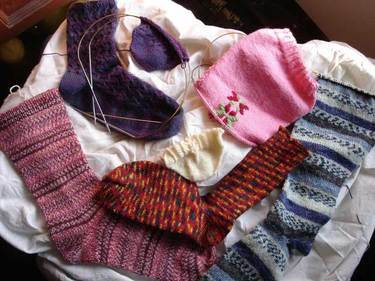 Let me know and I'll be back over the weekend to share what I've been working on (although I should warn you that it's been mostly work and little play knit). All along I thought I'd use a stitch pattern and a single color, but when I sat down and thought about them I kept coming back to colorwork. I wanted something subtle, so at first I thought I'd just alternate between 2 colors to get a really muted, shaded effect. I started drawing out little stitch patterns and eventually I got to an actual pattern. Now, I know you can't clearly see what pattern is there. Occasionally the 2 colors of yarn that are next to each other almost match. But I like the overall effect -- it's blended, but you can definitely tell something is going on there. I've used a total of 4 colors -- the MC, plus 3 others in the stranded area. The stranded area can use little scraps -- making this the perfect project for using up scraps from leftover socks. My stranded knitting technique is probably my weakest and this project is giving me some great practice. Gauge isn't terribly important as long as I can slip them over my ankle and let them slouch a bit on my leg. Blocking will be my best friend for this project! I've found my stranding is pretty even in the middle of the row. 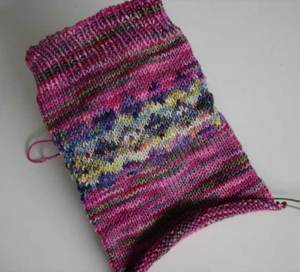 My problem is deciding how loosely to strand when it's between the 2 needles. I still need some practice before I know just how much to leave. I was thinking about cutting a piece of cardboard and inserting it so the yarn would be forced to follow the shape of the cylinder. I'm open to other suggestions though. Maybe it's just something I need to work on for a while longer? The stitch pattern is really versatile. I can easily see making these up as armwarmers as well, and with less stitches they could definitely be made in a heavier wool. 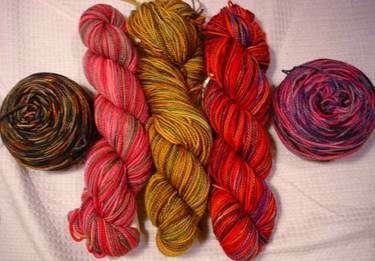 I'm already thinking about other lone balls of yarn I have in the stash to pair up for a totally different look. All this inspiration from "too much" sock yarn! 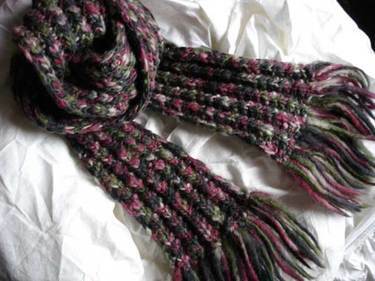 I made this mistake rib scarf in November 2004. It's a pretty basic scarf and normally wouldn't warrant a look back. The single ply yarn has developed a strong white halo (better visible if you view the enlarged version of the closeup). The colors have clouded and the texture has changed too. It's...hardened. The scarf has lost its drape, it's stretched out and narrowed as well. This combined with the texture changes make it hard to wrap around me in a way that actually covers my neck sufficiently. And the fringe edges keep sticking together too. It feels like it's in a pre-felting stage. I blame all these problems on the yarn. I can't imagine a sweater in this yarn would wear very well. The scarf wasn't my everyday scarf so it didn't get a ton of wear. I'd envision the same hardening/felting happening at the elbows or where the arms rub against the body sides. I really don't recommend this yarn. By some kind of feat only short of a miracle, I've made it into the finalists for The Best of Blogs 2005 Best Knitting – Craft Blog. There are some great blogs in there, and I'm thrilled to be put in the same category with them. So, go vote for your favorite! I have a Jeep Wrangler (very little between you and the outside on the floor of the Jeep) and while my legs get cold my feet are just fine. 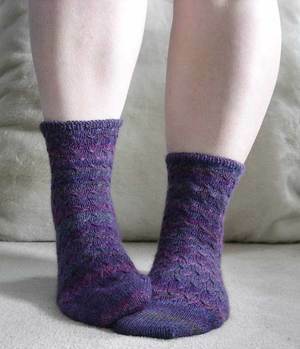 I think legwarmers would do the trick--I hate hot feet so I usually wear knee highs or just deal with cold calves. I can already think of a few ideas for making up a pattern for them. In other words, it's a great excuse to do a little designing. They'll use at least 2 balls of the Koigu, which was a big requirement for me. I don't want to make 2 projects out of the same exact shade of Koigu. I just know I'll end up not finishing the second project, and that'd be such a waste of the yarn. Pixie's bandana suggestion. VERY cute idea! Mary Beth's suggestion to do a turtleneck similar to Annie's. I like this idea A LOT but not for the colors I have right now. I will keep this one in mind though as I visit the LYSs. I see a T ranging from blacks at the bottom into greens and maybe a touch of pink. This will definitely mean I'll have to collect some yarn though. Dharma'a suggestion to do the Foxy Shawl. How pretty! 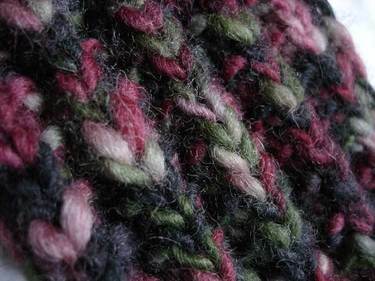 I love the gradation going longways (similar to the pooling scarf without the anxiety of forcing handdyed to pool!). While you're looking at the Foxy Shawl be sure to visit the rest of Foxy's site. There are tons of Koigu patterns there! So what does beccamonstr win? Well, I've emailed her* asking for a little direction in terms of the colors she likes. Koigu is too nice not to be used, so I want to make sure it's something that'll suit her. Once we chat and I do a little stashdiving/shopping I'll be sure to show you all too. I do still plan on making some of the double hanks into socks. One thing I've heard or read though is that Koigu socks tend to stretch out. 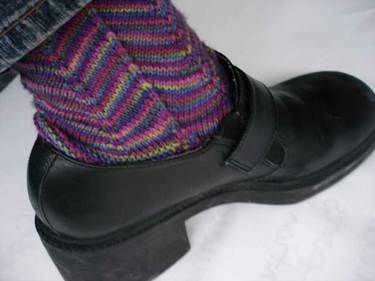 Those of you who have made Koigu socks--do you find this to be true? Either way, I'd like to hear about it (including the gauge you used). I suspect some of it may be due to a looser gauge, but I'd like to know now so I can do this yarn right! *I'm slightly concerned that my email might get filtered out as spam since it has the words "contest" and "winner" in it. If you didn't get my email please email me at savannahchik AT yahoo. Thanks!